HostingFactor.com Review 2019: Is HostingFactor.com a Good Hosting? HostingFactor.com was established in 2003 as a web hosting company offering the following services: shared hosting, VPS hosting solutions, and dedicated server solutions. With over 17 years of experience, HostingFactor.com has the technical knowhow necessary for dealing with practically any hosting issue any of its customers would face. Over the years, this vendor has developed a portfolio of web hosting solutions that include shared hosting, VPS hosting solutions, and dedicated server solutions. The HostingFactor.com website is only available in English. The HostingFactor.com data center is located in Las Vegas in the United States. Its servers run the latest in security software and are monitored round the clock to ensure every process runs without a hitch by identifying faults before they bring down the system. These servers are connected to a high-speed network that ensures uninterrupted connectivity. All packages in the shared hosting solutions from this vendor come with unlimited bandwidth, unlimited subdomains, unlimited FTP accounts, unlimited email accounts, and unlimited autoresponders. The packages also includes disk space of up to 30GB. The HostingFactor.com cPanel and WHM login pages are protected over HTTPS. The SSL-protected control panels add an extra layer of security across the vendor’s hosting network. What’s more, cPanel is available in multiple languages, including English, Dutch, French, Norwegian, German, Portuguese, Spanish, Bulgarian, Ukrainian, and Russian. HostingFactor.com offers daily backups powered by R1Soft. This notwithstanding, the vendor requires that each customer maintain a current copy of his/her website data. HostingFactor.com’s hosting plans are a little more expensive than the average vendor would charge for the same solutions. The vendor’s customers can choose to pay for their hosting subscriptions per month or once a year. Now and then, the hosting provider runs promotions and gives discounts, sometimes discounting as much as 20% of the monthly fee to new customers. HostingFactor.com has a 30-day money-back guarantee, no questions asked and a 99.9% uptime guarantee. 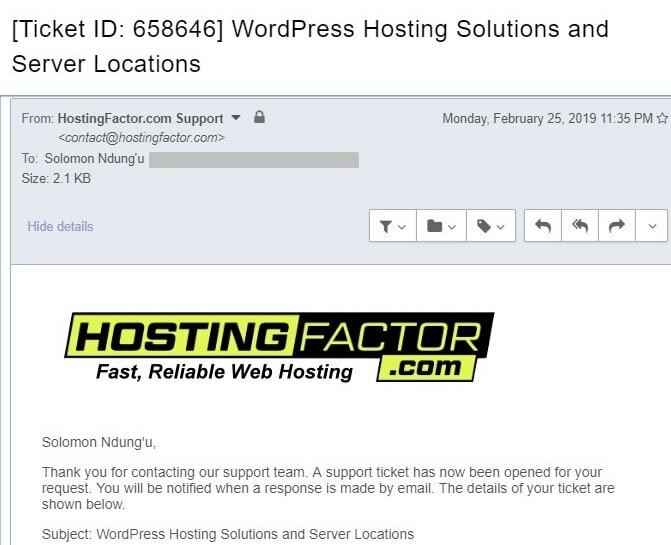 You can contact the HostingFactor.com support team via its​ ticketing system, live chat, or email. The ​support team is available 24/7​. The vendor does not have phone support. I sent them an email and received an automated message, the vendor acknowledging receipt and giving me a ticket number and a URL to help me track the progress of my ticket, however, the URL returned an error and my enquiry didn’t receive a response. The vendor also has a knowledge base with a significant number of hosting tutorials and articles, addressing quite a number of issues that most users are likely to encounter. While HostingFactor.com has developed hosting plans that are feature-rich, they are not very affordable. Couple this with the fact that its support team is highly unresponsive and you have a reason to be cautious before choosing this vendor’s hosting solutions. This is especially important for novice webmasters who might need a little more guidance than most. However, for more experienced users, the vendor’s knowledge base should suffice. 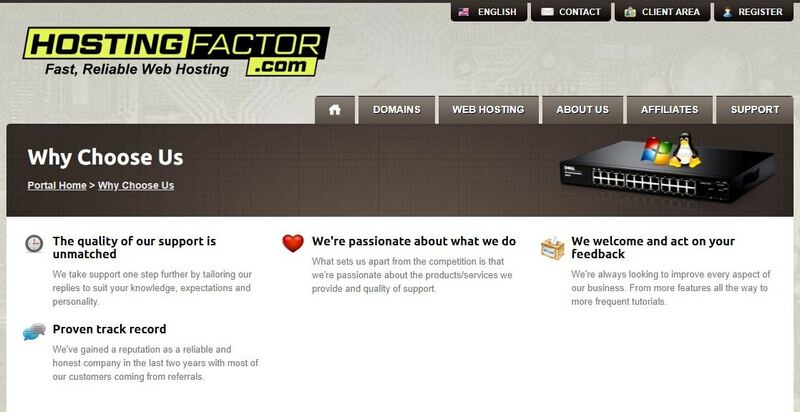 Wondering how HostingFactor.com stacks up against other Web Hosting companies? Enter any other Web Hosting company and we will give you a side-by-side comparison.